Never again do you need to rewind and guess your position, so as to listen to the last audio edit that you just dictated, instead you can now instantly rewind to this position with our new Instant Rewind feature. To enable this new feature, simply elect the Hand Control Training option under the Help menu and then select the Rewind button and enable the new option called "Rewind position to last edit". Up until now, any file that became Overdue, the colour of the filename and the file notification icon changed to Red. However we have received feedback from a few users, that this was causing confusion, because Red was the same colour used for Urgent files. So what we have done now is change the colour of all Overdue files to Purple rather than Red. Below is updated summarry of the current file notification colours. To help to visual represent the status of all files in the QS Player, we have changed the filename colour to Gray for any files that are locked e.g. in progress when "Display Locked Files" is enabled. Note: If a file is locked, it does not mean that someone else can not open the file and transcribe it also, but you would only do this if you have already spoken to the typist currently working on the file and your aim is to load share the work, whereby the first typist might type the first 50% and the second typist types the second 50%, otherwise you will both type the same file, which would be a waste of time. Recently had a request from a typist who does transcription work for the National Geographic from video tapes, whereby in addition to providing a text transcript, she needs to add time stamps periodically within the document, so an editor can quickly cross reference the text transcript with actual position within the video. Providing the audio is provided in the future as a digital audio file rather than a video tape, we have made the process a lot easier, whereby within the QS Player we have added the ability to press a new Hot-key (default is CTRL 2) which automatically captures the current audio position (HH:MM:SS) and pastes it directly into the current document. Needless to say it works great. Another advantage of this process is the turn around will be a lot quicker, as the typist no longer needs to wait for the video tape to arrive via courier, rather the files arrive via e-mail. Often when making C.B.T (Computer Based Training) content with the Quikscribe Recorder, you often find that you need more screen shots when do post editing, so that you can better explain certain parts in greater detail etc. However rather than reproducing the exact conditions again to capture just another screen shot and/or manually exporting the image from the marker, then creating a new marker and then importing the image into the new marker, we have added a new feature called Clone Marker. As a result, if you need more images of a particular screen shot, you can select the marker you want and then simply press 'Clone Marker'. As a result a new marker with all of the same attributes e.g. Screen Wipe, Label, Compression method and image etc will be duplicated at the same position within the audio file. All you need to do now is make the graphic changes you want to highlight the specific feature you are describing and then reposition the marker within the audio file accordingly. If you have never made C.B.T. content before, this feature may not appear to be all that useful, but if you have ever made C.B.T. content and found the need for additional images, you will absolutely love this time saving feature. Note: The Clone Marker option is available from the Marker menu and from the Marker Display screen. Up until now, if you rewound or fast forwarded to the end of an audio file, you would not know when you reached the end of the audio file unless you were physically looking at the interface. So what we have done now, is add this audio prompt as a 'End of file notification". Up until now, we have always been able to Cut & Paste text into a marker. However this feature always used 'Rich Text' so as to keep font formatting etc. However last week, it was brought to our attention by a Attorney in the US, that he could not successfully Cut and Paste text from a reference site, as additional information (unseen formatting data) was also being copied into the marker. This new feature was suggested by our users when we requested feedback for new ideas and was voted as one of the top 10 new ideas to add, so we have added it. With this new feature, an author can retrieve a file providing it has been sent via LAN (not FTP or e-mail) Note: If the file is already in progress e.g. being transcribed, the author can not retrieve the file. Instead, the author will be notified that the file is in progress, by who (typist name) and the current percentage completed. This new feature was also suggested by our users when we requested feedback for new ideas and was voted as one of the top 10 new ideas to add, so we have added it. With this new feature, an author can delete a file providing it has been sent via LAN (not FTP or e-mail) Note: If the file is already in progress e.g. being transcribed, the author can not delete the file. Instead, the author will be notified that the file is in progress, by who (typist name) and the current percentage completed. 1) Added the ability to configure the Send File Button so that it will Send the current audio file and automatically create a new audio file, thus eliminating a step. This is ideal for those who are continually produce a lot of dictation files that are very small. 2) Added the ability to configure the the Send File button to Send the file based on the default settings or Send the file as Urgent, by simply holding the Send File button down for a second rather than just pressing it. In doing so, we have eliminated another step. Note: You need the latest version of the Quikscribe Viewer to view the above DEMO. Up until now, the Quikscribe Player has provided typists with visual notification when audio files are waiting to be transcribed. However, one downside of this feature is that the Quikscribe Player needed to be open, else no notification was provided, hence transcription work could be accidentally overlooked. So what we have done now (because of valuable feedback from our clients) we have implemented an 'Auto File Notification' feature, whereby the typist will be automatically notified regardless if they have the Quikscribe Player opened or not. Which means, never again will waiting audio files go unnoticed. Note: To enhance this new file notification process, we also play a audio prompt, which is in addition to the visual prompting when the Quikscribe Player is opened and minimised in the task-bar. Documented "How to associate a wav file within MS Outlook with the Quikscribe Player"
A popular request from our recent request for new ideas, showed that a lot of users would like to know how to associate a wav file within MS Outlook with the Quikscribe Player. As a result we have made up a special page that explains the process, step-by-step. 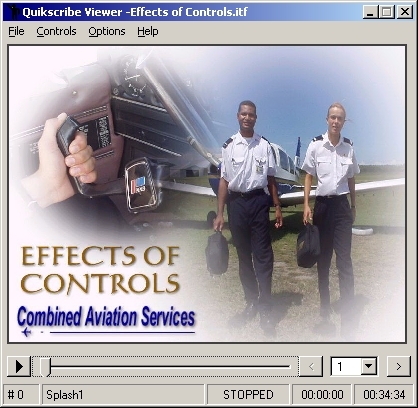 Rather than just displaying a blank opening screen within the Quikscribe Viewer when distributing content (made by the Quikscribe Tutor), we have made is possible to customise and create your own multimedia (audio, visual, screen wipes) splash screen, hence allowing you to professionally brand your training or presentation content or product. Up until now, if you started dictating but didn't press the record button at the same time, you would clip the first word or two of your sentence, but not any more. We have now implemented a new recording mode called 'Pre-emptive Recording Mode' that automatically captures your audio, even when you are not even recording. Which means you will never clip a a word when dictating again. Note: To enable "Pre-emptive Recording Mode" click here to view how. Note: Whenever an audio file is imported and opened by either the Quikscribe Recorder or Quikscribe Player, it is automatically imported and converted to a IAF (Intelligent Audio File). The reason that this is done, is so the audio file now inherits all of the advanced features associated with the IAF format, such as the ability to embed text, insert images, files and attachments and be encrypted. It also means that the file can now be fully managed by the Quikscribe Manager as it now has its own metadata within it, which both the Quikscribe Recorder and Quikscribe Player can write to and the Quikscribe Manager can interrogate. Making Computer Based Training content has never been easier and now with the Quikscribe Tutor you can make distributable ITF (Intelligent Tutor Files) which can then be viewed with our FREE Quikscribe Viewer. To find out more, visit the new QS Tutor page that we are currently working on. Note: In addition to producing high quality training and presentation content. The Quikscribe Tutor can also protect your finished compiled content, so it can never be modified, exported or changed. Plus in the very near future we plan to add file registration, whereby files can be protected, so they can not be viewed unless they have been unlocked, and once they have been unlocked, they can only be viewed on the PC that they were unlocked on. If unlocked and then copied to another PC or to CD, they will revert back to being locked. We have specifically made our ITF (Intelligent Tutor File) format designed for the Business market, not the Consumer market. Which means unlike, MP3's Wav or CD, which can be easily copied (pirated) our format is requires live online registration that is PC specific. The Quikscribe Recorder is now able to seamlessly send audio files via FTP in addition to LAN and E-mail. With this new feature, it can also send and split files, encrypt files and or send as a .wav rather than and IAF. (Providing the appropriate options are enabled). To set up and configure FTP within the Recorder, do the following. 1) Select the Send File Icon. 2) Select FTP option from the drop down list. 3) Double click on the address area to bring up this FTP Connection screen. Note: Click here to view these steps. Note Should an audio file be sent via FTP but for some reason it is unable to establish a connection with destination FTP server or the connection fails while uploading, the Quikscribe Recorder stores the file in a directory called Pending and will attempt to upload the file as soon as the connection becomes available again. Additionally it will provide the author with feedback if it was unsuccessful sending the file, so that the author can then investigate why the connection is down, which is outside of the control of Quikscribe. 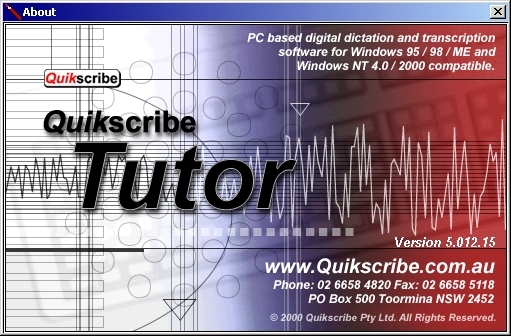 Using the Quikscribe Tutor (modified version of the Quikscribe Recorder) it is possible to build and deploy C.B.T (Computer Based Training) content or Presentations in minimal time. To view the content produced, we have created the Quikscribe Viewer which is available for FREE. When viewing the content you watch in the preview interface below (400x300) or view the presentation in full screen mode (800x600). Note: In the near future we plan to create and upload a whole series of training files specifically designed to teach new and existing users how to use Quikscribe as well as more advanced presentations showing how to make Computer Based Training content, how encryption works plus a whole range of associated topics relating to digital dictation and transcription. The ability to cut and paste text into an IAF file using the Quikscribe Recorder just got better. Previously you would need to select the text you wanted, then press CTRL C (to copy the text to the Windows clipboard) then press CTRL 7 (which is default hot-key within Quikscribe) or press the Insert button on the Quikscribe Recorder Hand Control. But now all you need to do is select (highlight) the text you want and press the Insert Button on the Quikscribe Hand Control and Quikscribe Recorder will automatically copy the text, create a new marker within your audio file and then paste the text into the new marker.